Well, that was a race worth waiting for and equally not the race we'd hoped for. The European Championships Women's Marathon took place on Sunday on a 4 lap course around Berlin. 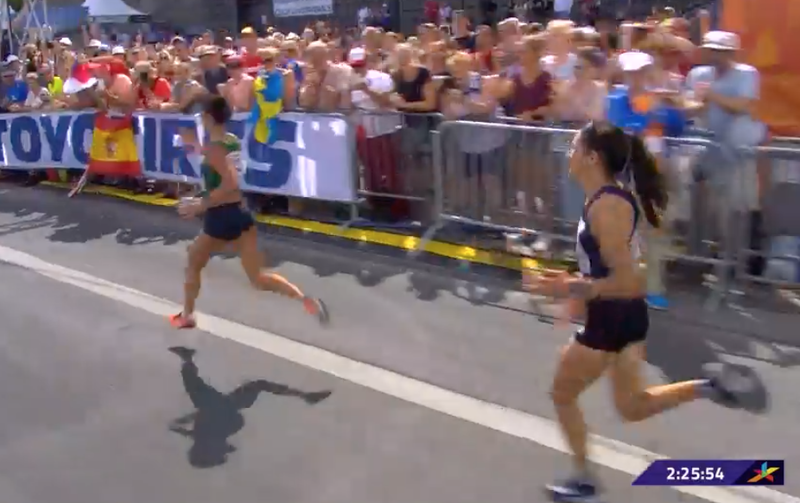 For team GB, Purdue and Partridge were in the lead pack for a good while with Samuels and Barlow together in a chasing pack and Carly Jones running solidly behind. My non-GB shout in the preview and Germany's favourite and on paper a strong contender - Heinig - slipped off the pack very early into the race presumably expecting others to come back to her but sadly that didn't happen and she ended up being held off by Tracy Barlow to come 16th. Seemed like a waste of a home advantage to me. Hey ho. Just after 10k Mazuronak got the most horrific nosebleed. She looked like she'd been in a fight! Weirdly you can't tell by the end but it went on for an awfully long time. She was having to stuff tissues up her nose which certainly isn't your standard breathing technique. Still though, you wouldn't have know anything was wrong from her demeanour. Lily Partridge was still sticking with the lead group when Charlotte Purdue pulled up just after 10k. She could be seen tearfully telling the team doctor that she couldn't run and the commentators suggested that it was a calf or achilles problem. She has since posted on her Instagram that "Unfortunately my hamstring and calf cramped up at 8K and it was impossible for me to carry on running. I've never had it before and I’m still working out what went wrong. My preparation was perfect and all this training won’t be wasted, I’m taking some time now to figure out what comes next" Gutting. This was a hit for the British team race but we still had hopes. Lily then started to drift off the back of the front group a bit and later pulled out herself due to stomach issues. 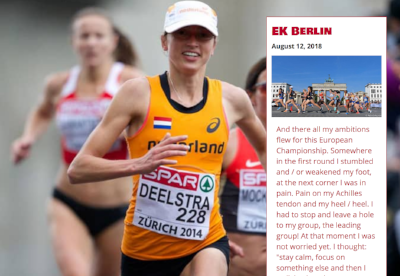 Deelstra of the Netherlands, who I'd focussed on due to her 2015 Berlin PB, was another runner who didn't make the cut. She later commented on her blog she'd suffered pain in her Achilles /heel area and couldn't walk let alone run. She says she knew she was in good form and plans an Autumn marathon to show the shape she was in. It's a blow to her aim to run Tokyo 2020 and Paula Radcliffe was a bit dismissive of her during the race. I wonder if that's justified or whether this situation will give her some fire in the belly. Clemence Calvin of France was running her debut marathon. I'll be honest, she had me chewing my nails for the whole race wondering if / when she was going to struggle but despite being a bit wobbly in form by the last lap she held strong and ran an incredibly measured race sitting right on the shoulder of Mazuronak for most of the time. Briefly as the passed the Kaiser Wilhelm church for the last time she tried to take the lead but Mazuronak showed her cool and took it back even after nearly going the wrong way. And then... just at the end, the moment she could see the finish it was like Mazuronak hit a switch and literally changed up a gear. She opened up her hands, pumped her arms and 'sprinted' down the home straight to finish in 2:26:22 and leaving Calvin with nothing extra to give but just moments behind her in 3:26:28! It's funny that she could so carefully stick with the Belarussian all the way through but just didn't have that extra surge at the end. It really felt like it could go either way though right to the end. I would love to know if you spoke to Calvin afterwards whether she thinks now that she could have done more. I'm not saying I'm not incredibly impressed and I've certainly never had a sprint finish after 26.2 but it's on my mind because I've been reading a fascinating book called Endure which looks at the limits of human endurance and why we think in the moment that we can't go harder and then instantly afterwards feel like we could. To top off that exciting finish, Czech athlete Eva Vrabcova-Nyvltova got a 3 minute PB to come 3rd and run a national record of 2:26:31. That's particularly great considering that championship races are not known for being the fastest or easiest to run fast times at. It's so sparse compared to a big city marathon - not the crowds of runners to work off. Only 9 secomnds between the top three though, wow! So the team results was Gold for Belarus, Silver for Italy and Bronze for Spain with GB taking 4th which given that we lost two athletes was pretty darn awesome work by Barlow, Samuels and Jones. Barlow ran a smart race and talking to Fast Running she seems happy with how it went, though Samuels was disappointed in her performance and Caryl Jones hasn't said what she thinks yet - I really hope she enjoyed it and was pleased to beat her Commonwealth Games time. Also of note (thanks to Kate Carter for the heads-up and info) was Italian runner Catherine Bertone. The 46 year old doctor who specialises in infectious disease came 8th in a time of 2:30:06 and has the women's 45+ world record marathon time from Berlin last year (2:28:34). This lady deserves a blog post in her own right and will be receiving one soon. I'm going to do a full spreadsheet showing the results VS PB's so that will be added to the blog soon! I'm afraid I've run out of time to reviewany of the races below but please get in touch if you ran any of them! Chicago Marathon have released the elite start list - more on that soon. It's not often these days that I find myself horizontal on a piece of lounge furniture in the early hours of a Sunday. When such a rare event occurs it usually means either injury or ongoing Olympic Games in a far away time zone. This weekend however, without any niggles or looming south pacific Ping Pong semis I scheduled my last run of the week to an indecently early hour (well for a bat girl at least) so that come 9.30 I was lying flat out in the sofa with an ipad on my belly trying to tune in the Salomon You Tube channel. Us trail-heads are not exactly spoiled with live coverage of our favourite sport and usually christmas only comes once a year with the real time screening of UTMB. In 2018 however Salomon has switched things up a notch by sending out a hoard of brave mountain biking camera (wo)men to their Golden Trail Series events in order to get live footage from the main course and this Sunday it meant that I could enjoy the sound and vision of a speedy field of runners taking on the beautiful trails between Sierre and Zinal in the swizz alps from the post run comfort of my IKEA three seater. WIN WIN! This longest running mountain race in Europe, is quiet unique in the way that it attracts a very wide spectrum of runners. The (for mountain trail races speaking) short course starts with a big climb up to Conchette where it follows a, sometimes technical but very runable, single track traversing the mountain before it finishes with a long descent down to the tarmac of Zinal. This structure of the course means that there will be a section playing to the strength of both trail, road and mountain runners which might explain why the Sierre start line was toed by both fearless sky running queens as well as 2.30 road marathon cheetas. Last years champion Lucy Wambui Murigi from Kenya repeated her tactics from 2017 by using her uphill strength to take an early lead on the first big ascent. She came into the aidstation at Ponchette after the 8 km long initial climb up to 1870 m above sea level with 50 seconds down to Michelle Maier from Germany and two minutes ahead of Victoria Kreuzer and Laura Orgue. Behind the top four was a big chasing pack including Ruth Croft, Simone Troxler, Megan Kimmel and Ida Nilsson. On the following flatter but more technical stretch we could see from the sofa that Murigi was repeatedly falling over and it looked as if she was loosing some ground. Her gap to Maier had shrunk from 1.30 at the 12 km mark to a mere half a minute as the runners reached the highest point on the course at Hotel Weisshorn (2337 m). By now Simone Troxler had moved up the field and came in as third lady with Ruth Croft hot on her heels and suddenly the race for the podium places was back on. Wambui managed to regain some strength during the last section of downhill running and came out from the woodland of Barneuza as the only lady in sight and not far off the course record. She crossed the Zinal finish line in 2:57:54 and history repeated itself as Maier managed to hold on to second in 3:01:30. Behind them followed a furious fight for the podium of which Simone Troxler came out as the winner 15 seconds ahead of Ruth Croft. Behind them there was some inspiration to be had for running mothers like myself and Gill as Elisa Desco, back from having given birth to her second child, had moved up several positions during the descent into Zinal and claimed 5th in 3:07. Then they came thick and fast, Megan Kimmel, Eli Gordon, Ida Nilsson and Victoria WIlkinson all finished within twenty seconds of each other. There was only 12 minutes behind the first and tenth lady which for itself speaks of the high level of this years starting field. Covering two flat counties along its way the route of The Stour Valley Path rolls through some beautiful East Anglian scenery famed for inspiring painters such as Thomas Gainsborough and John Constable as well as author Beatrix Potter. Fastest of the runners out channeling their inner Peter Rabbit on the long course was frequent Centurion-podium-visitor Christine Howard. Finishing 9th OA she came into the finish line in Brantham in a time of 11:10, 47 minutes ahead of second lady Diana Vulpe. Rounding up the podium was Tania Pacheco in 12:16. On the shorter course the victory went to Annie Byrne who covered the 50 km in a speedy time of 04:13:33 which placed her 4th on the OA rankings. Fifty minutes behind was Anna McNestry who finished just one minute ahead of third fastest bunny; Katarzyna Sienko from Australia. If you like me enjoyed the scenery and excitement provided by the live coverage of Sierre-Zinal there is a reason to jump for joy as The Golden Trail Series continues this weekend and the Salomon camera crew contingent will be out in action. Sundays commentator Emelie Forsberg will be back in front of the camera but this time as a competitor in the 42 km long 2382 m steep beast of a race across the peaks of Colorado. She wont be the only feature returning from last weeks footage as Megan Kimmel, Ruth Croft and Laura Orgue will be there to toe the line with her. I reckon that the fight for the title will be between the four of them and homegirl Alicia Vargo. Emelie should have an advantage of fresh legs having not raced in Sierre-Zinal but it remains to be seen if that will be enough to hold off the rest of the pack. Tune in on Salomon's YouTube or Facebook page this Sunday for another visual trail treat! Colorado is not only gearing up for Pikes Peak Marathon as this weekend will also see the start of the 35th edition of the legendary Leadville 100. Sadly I could not find any entrants lists for this year so from what I could gather from a bit of instagram stalking my bet is on Abby Mitchell to bring home the trophy! Hopefully we will be back with more names and numbers from this rockies-classic next week! As if Leadville and PP marathon wouldn't be enough for the mountains of Colorado they are also hosting a stage race over this week. TransRockies Run is underway since Tuesday and after the first stage of this 6 day / 120 mile race Lucy Bartholomew and Hilary Allen (ahem DREAM TEAM) are in first place just ahead of the El Kott twins! In Sweden it's the weekend of Ultravasan which follows the route of the legendary Cross Country Skiing event and at home in the UK there is the Beacon 100/50 to look forward to. Finally I want to round things up by bigging up Queen Bland's come back performance at the Orion Forest Five this weekend. She managed to bag 3rd place with a strong race finishing in 33:04! Go Gill!